A wide variety of materials to choose from. We all get it, the desire to have granite in our kitchens comes from the abundance of home improvement shows highlighting the material. But what about being a little different and venturing into different pastures? Beyond granite, there are a variety of materials that may actually be more practical for you and your family. Softer than granite, marble is able to be scratched and stained quite easily. That being said, it creates it’s own patina when it gets scratched and stained giving a distinctive look. The aging process allows the marble to give off a very nice, clean look. Some people are drawn to the warmth of the material. A natural, smooth, matte stone, soapstone comes in a variety of hues ranging from soft gray to charcoal. As one of the only natural stones that are unaffected by acids, any coffee spills won’t leave a stain. Soapstone is also known to be that resistant allowing you to place your kettle directly on it without worries. Cleaning soapstone is very easy since it doesn’t require any special cleaners to maintain the original shine. Conceivably one of the most durable countertop materials on the market, quartz comes from one of the hardest minerals on earth. 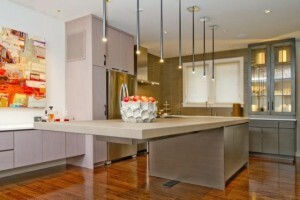 Coming in a variety of colors, quartz countertops are known to be some of the most eye-catching. However, unlike other natural stones, quartz countertops are engineered in a factory, giving them a scratch and stain resistance not found in many other natural stones. Available in a variety of finishes, such as honed, sandblasted or embossed, there is a style of quartz out there for you. This entry was posted on Friday, January 13th, 2017 at 9:51 am. Both comments and pings are currently closed.